At SARBKAR North West we pride ourselves with having an excellent standard of customer care and we provide first class service and repair facilities. With highly qualified and experienced staff, our aim is to look after all your motoring needs and provide excellent value for money on servicing, MOT and repairs. 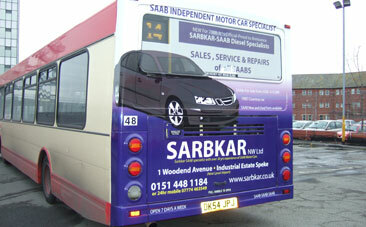 Sarbkar North West have now invested into a number of advertising Projects on Merseyside Bus routes. Keep your eyes open for the buses! this will be an ongoing project for 2008. 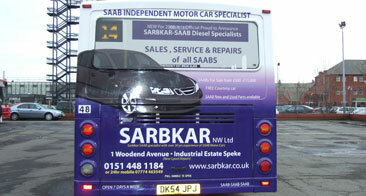 The advertising campaign combines with a number of other business strategies for 2008 to strengthen Sarbkar in the independent Saab Specialist Market place and to make them the number one choice on Merseyside. Tony Standish - Managing Director, has been so busy the last few weeks. 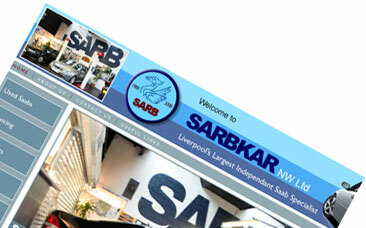 The redevelopment of his new website has now been launched with full Saab car sales on line. "We do get a high number of enquiries from our customers on line and sometimes I may be speaking to someone in Sheffield who is looking for a Saab car to purchase. In the past I could only describe or email the details to them. Now im in a position whereby I can ask them to go onto the website and let them see the cars I have on for sale. This facility puts me in a more competitive position and im sure 2016 will be a great year for Sarbkar North West."